15. Satan appears as the man of sin and deceives the world into worshiping him using lying signs and wonders. A. Prior to the return of Christ, there will be a falling away (2Th 2:1-3). B. At that time, the "man of sin,...the son of perdition" will be revealed (2Th 2:3). a. A minister of God is called a "man of God" (1Ti 6:11; 2Ti 3:17). b.	Satan has ministers who imitate God's ministers (2Co 11:13-15). c.	It's reasonable to conclude that Satan's prime minister would be called the "man of sin." a.	Judas is the only other man in the Bible called the son of perdition (Joh 17:12). b.	Judas was possessed by Satan (Joh 13:27). c.	Judas was called a devil (Joh 6:70-71). d.	Judas was a disciple of Jesus Christ (Luk 6:13, 16). e.	Therefore, it stands to reason that the man of sin and son of perdition will be a professing "Christian" who will be inspired and possessed by Satan. C.	The man of sin will be able to work miracles by the power of Satan (2Th 2:9). i. Since Jesus and the apostles did miracles, Satan needs to do them too. ii. The Catholic Church has long boasted of being able to perform miracles. iii. The modern Charismatic movement could be a fulfillment of this. D.	The man of sin will sit as God in "the temple of God" (2Th 2:4). i. The Jewish temple was destroyed in 70AD and any rebuilt temple will not be "the temple of God." ii. The temple of God is the NT church (1Co 3:16-17; 2Co 6:16). iii. Therefore, the man of sin will (or did) arise in the church of God. iv. The papacy fits the description of the man of sin quite well. a. The Roman Catholic Church began as a true church (the church at Rome). b. The pope has a times in history claimed to be God on earth. (viii)	These quotes were gleaned from an article called "Pope Quotes Reveal They Are The Son Of Perdition" on the website christianitybeliefs.org. v.	The man of sin could also be a future leader of the church of Jesus Christ who exalts himself as God. a. This would appear to be the case since the revealing of the Wicked man of sin seems to be closely connected in time with the second coming of Christ, not hundreds of years prior to it (2Th 2:7-9). b. The timing of the revelation of the man of sin is unknown (at least to me). vi. 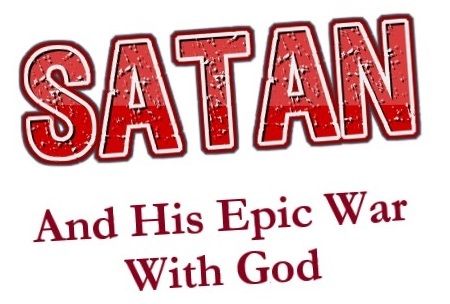 Through the man of sin, Satan will finally fulfill his lifelong dream to be worshiped as God (2Th 2:4 c/w Isa 14:13-14). 16. Satan establishes the beast and compels the world to worship him through it and kills those who will not worship the image of the beast or receive his mark. A.	Satan sets up the beast (Rev 13:1). i. The beast is a world empire (Rev 13:7). ii. It has seven heads which are satanic world empires (Rev 13:1 c/w Rev 17:10). b. The beast is the eighth world empire which is also satanic in nature (of the seven) and contains all the elements of the previous ones (Rev 17:11). a. One world government (Rev 13:2). (i)	This is Satan's attempt to be the sovereign ruler of the world like God (1Ch 29:11-12). (ii)	Satan wants to be the king of kings (Rev 17:12-13, 17) like Jesus Christ (1Ti 6:15; Psa 47:7). (iii)	The UN could be the beginnings of the one world government. (iv)	Politicians have been calling for a "New World Order" since at least George H.W. Bush. b. One world religion (Rev 13:4, 8). (i)	This is Satan's attempt to be worshiped by all of creation like God (Psa 33:8; Psa 66:4). (ii)	Since God's church encompassed all the earth, Satan's must too. (iii)	There have been moves in recent years by the Catholic Church to reach out to the other major religions of the world to bring them together. c.	One world military (Rev 13:4). (i)	This is Satan's attempt to be omnipotent like God (Rev 19:6). (ii)	The UN "peacekeepers" could be a precursor to a one world military. d.	One world economy and monetary system (Rev 13:17). (i)	We are heading in this direction with regional currencies like the Euro and with organizations like the World Bank and the International Monetary Fund. (ii)	There have been many calls for a cashless society in recent years. B. The man of sin is likely the second beast and the false prophet. i. The second beast is known for the wonders and miracles that he performs (Rev 13:11-14). a. The second beast comes after the first beast and causes the world to worship the first beast (Rev 13:12). b. The second beast is the mouthpiece of the first beast (Rev 13:14-15). ii. The false prophet is spoken of in connection with the first beast where the second beast is not mentioned (Rev 16:13; Rev 19:20; Rev 20:10). iii. The false prophet does miracles just like the second beast (Rev 16:13-14 & Rev 19:20 c/w Rev 13:13). iv. The man of sin does miracles after the working of Satan (2Th 2:9). C.	The beast and false prophet (second beast, man of sin) are used by Satan to gather the nations together to the battle of the great day of God Almighty (Rev 16:13-14; Rev 19:11-21). i. This battle happens at the end of time when the Lord Jesus Christ returns (2Th 1:7-9; 2Th 2:8). ii. Therefore, it appears that the first beast (world empire) and the mark of the beast that Satan sets up in Rev 13 happens near the end of time.